One winter day during the Siege of Leningrad — an 872-day World War II blockade that left more than a million civilians dead — a Russian nurse came across the body of a small boy. He sat at the curb, frozen solid, one hand in his mouth. 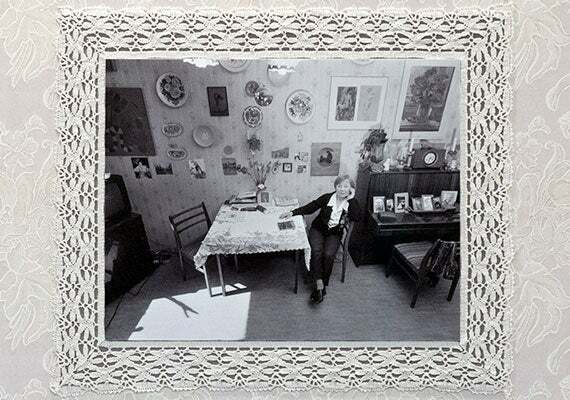 The images on display are artistically complex: black-and-whites of 12 survivors, framed with collages of artifacts from their apartments, lace or big-flowered wallpaper. Beneath each photo is a handmade album consisting of old photos, new photos by Bough, and newspaper clippings. Personal testimony is rendered in the photographer’s clear print. 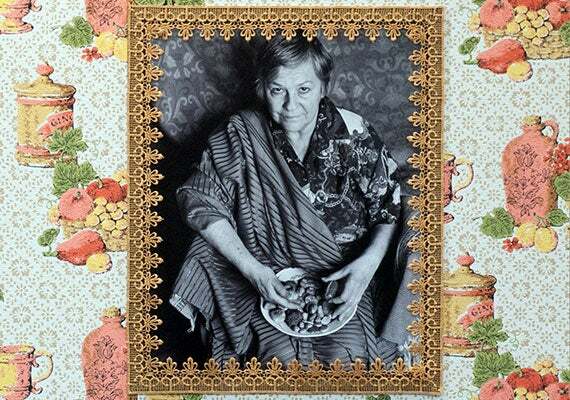 Galina: "We, the survivors, are bonded by a strange fate. There is even a name for us. Blokadnitsy." Nadya: "Adults would help me draw water, but no one would help me carry it home. People were not being cruel. They were surviving." Bough wanted viewers to experience the lives of these women at an intimate distance, one that was tactile, full, and personal; a portrait alone makes a viewer step back, she said. The nurse is called “Nadezhda,” a nom de guerre of a sort — just as the other 11 names were invented for the exhibit, eight years in the making. 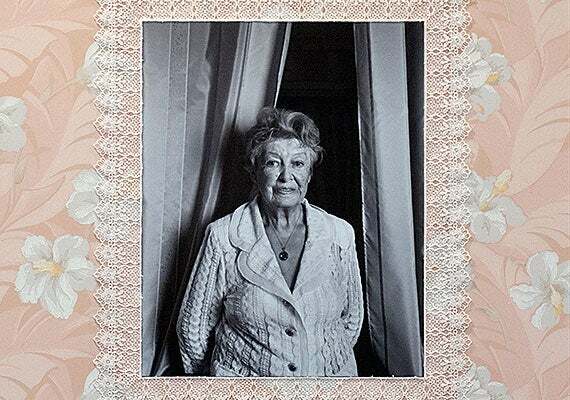 The women, in their 80s and 90s, were not just shy talking to an American, but reluctant to talk to anyone who had not seen the siege, Bough said. They had seldom mentioned the war even to their families, and guarded their privacy as they once did their own lives. “We saw everything,” said Galya. Today, she meets once a week with fellow survivors in a choir to rehearse old war songs. Trauma and loss are reflected in the ways the women live today. “They are hoarders,” said Bough of her subjects, who are still wounded by the deprivation they both felt and witnessed. The apartments themselves were oblique reflections of trauma — deliberately cheerful, as a rule, with full pantries, full shelves of books, and walls full of mementos. Nadya showed a picture of her father. He died — the family thought — fighting Germans at the front. “My whole life,” she said, “I have been waiting for his knock on my door.” Nadya is 84. There was another “constant theme” among the group, said Bough. The apartments were full of trinkets and maps and items related to travel — yet none of the women had ever ventured outside Russian borders. They all wanted to, but foreign travel was not easy in the Soviet era, for one. And they seemed fearful outside the ken of their tiny dwellings. Harvard is the first stop for “The Blokadnitsy Project,” sponsored by the Davis Center for Russian and Eurasian Studies. Bough will next take it to Bozeman, Mont., her hometown. But — still careful of her subjects’ privacy — she will not take it to St. Petersburg, the city that from 1924 to 1991 was called Leningrad. “They have no concept of how public things are these days,” said Bough. The survivors agreed on the idea of the show, and in the end wanted to tell their stories — but “I need to protect the women from their personal trauma,” she said. “The airport itself is this nice nucleus that can act as a container of broader ideas,” said Sonja Duempelmann (photo 1), who helped organize “Airport Landscape: Urban Ecologies in the Aerial Age” at Gund Hall this week. An exhibit of the same name is also on view through Dec. 19. Its color scheme, signage, and scale are all echoes of modern airports. It is the first time, organizers said, that every display space in Gund Hall has been given over to a single theme (photos 2 and 3.